We are a brand new American & English Pool Bar, boasting brand new, top quality tables where players can enjoy a game of Pool in a lively environment, or experience a calmer environment in our dedicated Snooker room. 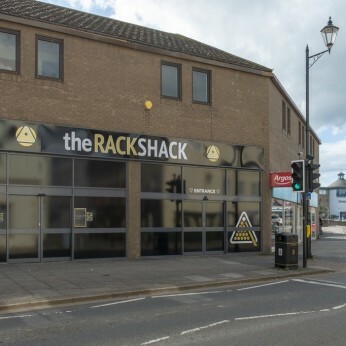 The Rack Shack is a relaxed, friendly venue to play snooker & pool and is an ideal place for those looking for something fun to do on a night out as well as for those simply wanting to get some practice in on tournament quality tables. You will find our tables are spaciously laid out allowing free play around the table and making them ideal for groups of up to 4 to comfortably occupy. We also have the luxury of providing 4 full size Snooker tables in a separate room, where Players will appreciate the quieter area in which they can immerse themselves in their game. We have a fully stocked bar offering a variety of draught, bottled beers & ciders as well as wine, spirits and soft drinks. We have quickly became known for serving one of the best pints in town - try our Heineken and judge for yourself! The Rack Shack is a large venue, making us ideal for groups/ parties. Please contact us to discuss your requirements and for information on offers. Children aged 11+ are welcome to play if they are accompanied by a parent/ carer otherwise they must be a club member (see offers page for membership info). Children must be able to play and be tall enough for the table. Juniors must be accompanied by a responsible adult after 7pm. Jimmy White at The Rack Shack! Come and have a drink in our newly furnished bar area and enjoy the great atmosphere.